& younger kids all together during Spring Break? Not willing to spend 50 bucks every morning and afternoon trying to entertain the crew? Then, get them together helping others! Whaaaaaa? Totally, do it. Do it! 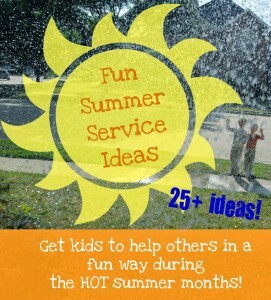 Let’s ask our kids to help others instead of running ourselves into a frenzy trying to entertain them. We’ve made it easy for you. 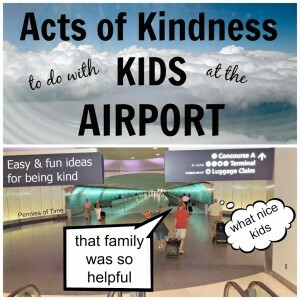 This post has popular ideas on acts of kindness and easy service projects for kids gathered from many writers that have a passion for getting their kids to help others. 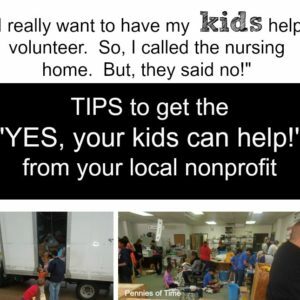 Grab this list of acts of kindness and service projects and have fun helping someone with your kids. 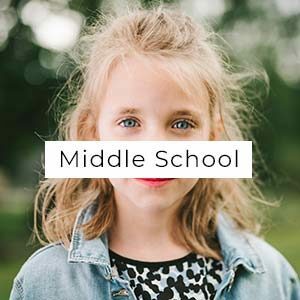 By the way, these are REAL ideas that kids can do. Not just some running list out of someone’s brain. 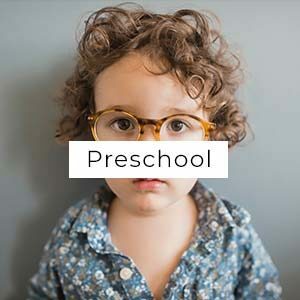 All of these ideas have been done by kids, real kids. 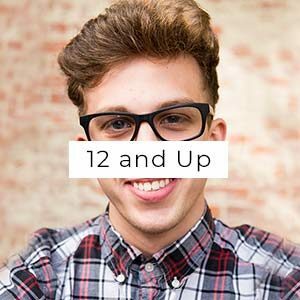 I’ve linked the ideas to posts to show you how those real kids have done it. 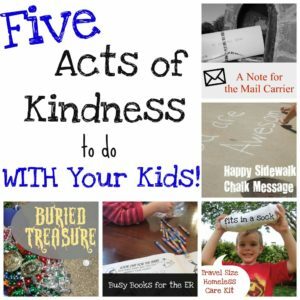 If you have kids that are older, put them in charge of planning the acts of kindness. 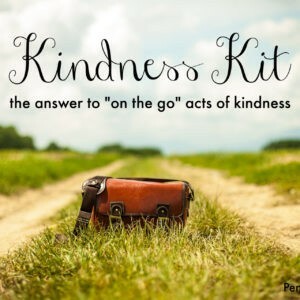 The “Little Things” Challenge Challenge your family to do the “Little Things” to be kind to others. 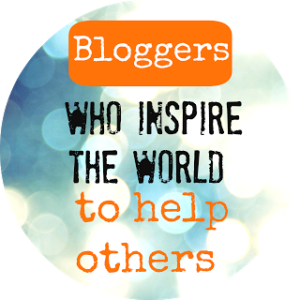 Say hello and thank you to people you interact with that help you. Don’t talk on your cell phone while you are out and about. Be present and teach your children to observe what is going on around and see chances to help others. It is Spring Time–so how about some spring cleaning INside and OUTside! Cleaning the creek is, by far, one of the more favored service acts for my boys. Check out our newly updated list of tricks and best tools for kids to use when cleaning a creek. 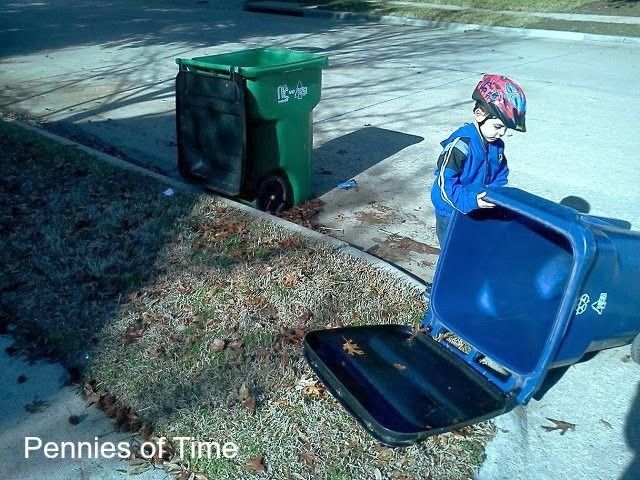 Clean up litter. That’s an easy one, right? Cleaning the church is a great way to involve the older and younger kids. We like to sneak in and clean areas of the church. Bonus: The kids always seem to act more reverent in church on the weeks we make the effort to clean it. Clean up the toys in the house and donate them as suggested by Trust Me, I’m a Mom. Take those looming passions and skills and make rubber band bracelets for a good cause: The Rainbow Loom Project by Kid Stuff World. Make get well cards and take them to the pharmacy to attach with their prescriptions suggests Barbara from The Corner on Character. Re-purpose household objects and thank an amazing person at the same time–see how to do it at The House of Shine’s Shineworks. 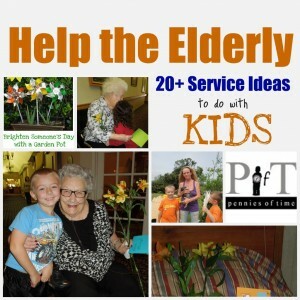 Make paper flowers and deliver them to someone that needs some cheer or just needs a thank you! Put together easy craft bags for your local hospital like Carly from Africa to America did with her young daughter. 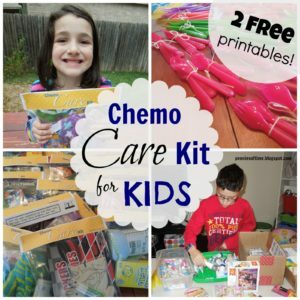 Make Chemo Care Kit for an adult or put together a couple of Chemo Care Kits for Kids. Hold a book drive for your local hospital. 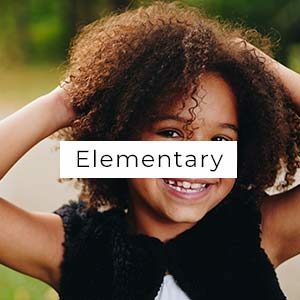 This is a great way to get your kids’ friends and the whole neighborhood in on the giving action. Bring in trashcans. Totally easy one right there. Give a couple of neighbors a “heart attack.” The boys enjoy doing this so much that we’ve been giving one away weekly for awhile. Feed your neighbors’ pets while they are away as suggested by Neighborly Acts of Kindness: 5 Ways We Show Love to Our Neighbors from The Good Long Road. Make cookie dough and deliver it! Donate books to your local library with your kids as suggested by Africa to America’s post on donating multicultural books to a library. Collect spare change for a cause your family cares about like The Good Long Road did with small kids to help fight hunger. 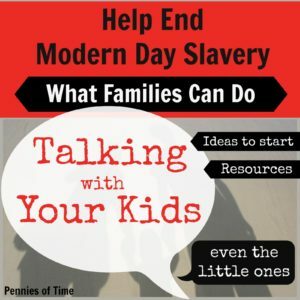 This gives the chance for your kids to talk to others about something that they care about helping. 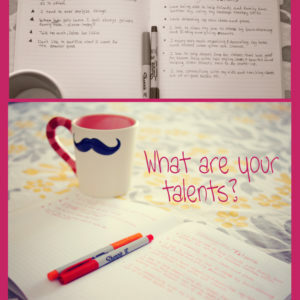 Talking with others, developing passion, and collecting for a good cause–slam dunk! Hold a food drive in your neighborhood or a Very Hungry Caterpillar Virtual Food Drive to Help Very Hungry Kids like the kids did at The Good Long Road. 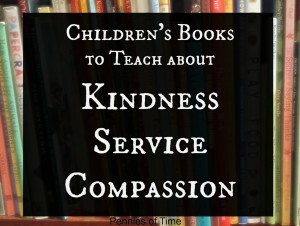 Here are the books that we love that talk about kindness, service, and compassion. All of books on the list linked above are ones that we read over and over, ones that the boys pull off the shelf and read in bed. “GIVE ME MORE LISTS” you say? You bet! 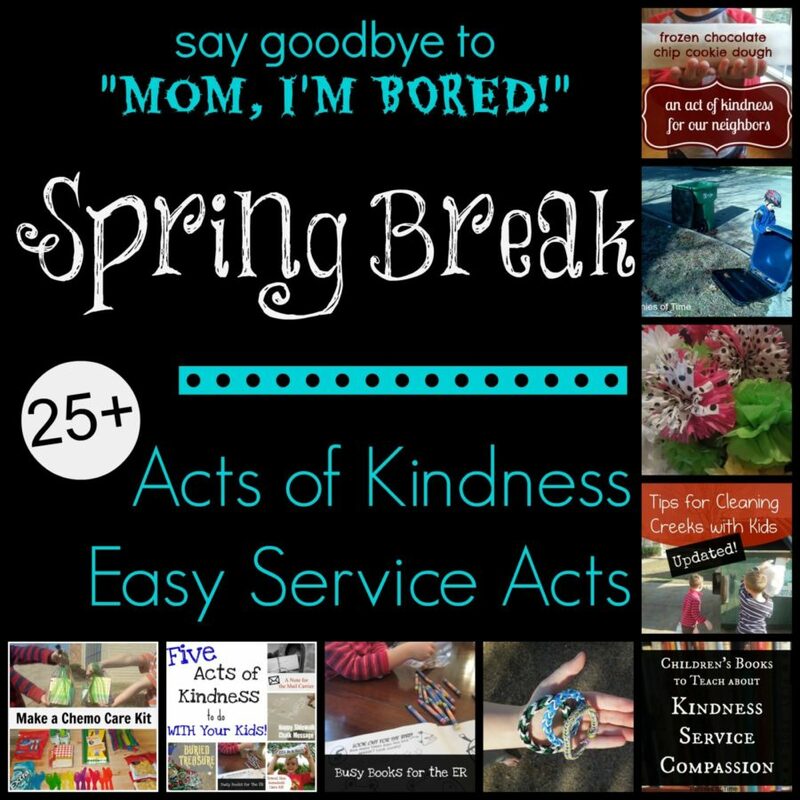 So, what acts of kindness or service projects are you doing with your kids during Spring Break?